Don’t Leave Southwest Points on the Table When You Rent a Car! Lyn blogs about Southwest Airlines at GotoTravelGal.com. 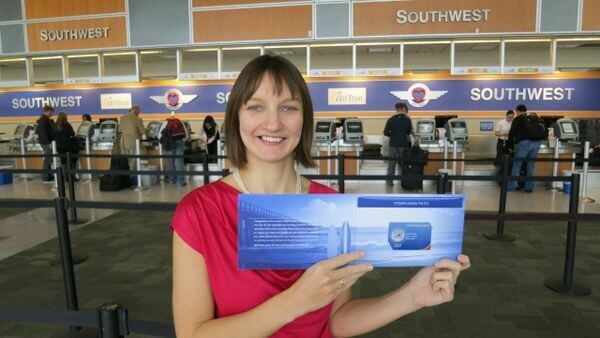 And she offers her free “Step-by-Step Guide to Earning the Southwest Companion Pass” to help you quickly and easily earn the amazing Southwest Companion Pass, which lets 1 person fly nearly free with you for up to 2 years. So I’ve asked her to share some tips on how to earn Southwest points when you rent a car. Lyn: Renting a car is a common activity for travelers who want an independent mode of transportation at their destination. Whether you’ll be sight-seeing around a US National Park, driving along the Pacific Coast highway, or just want the freedom to stop at the grocery and explore a destination on your own time, car rentals can come in quite handy. 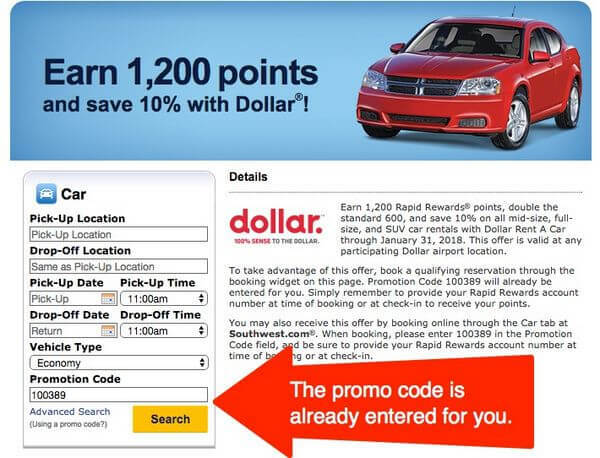 Did you know it’s quite easy to earn Southwest points every time you rent a car? But NOT all the points you earn will qualify for the Southwest Companion Pass. 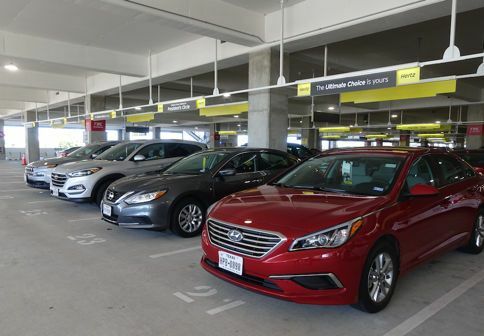 We’ve Got Tips for How to Earn Southwest Points on Your Next Car Rental! I’m going to show you the current bonus point offers from Southwest, explain a few caveats to help make sure the deal is right for you, and walk you through how to book your Southwest car rental. Not all Southwest points count toward the 110,000 points you need to earn the Southwest Companion Pass. Any points listed as “bonus points” DO NOT qualify for the pass, but can be used for free travel on Southwest. When it comes to car rentals on Southwest, for most companies, the first 600 points you earn are NOT bonus points, so those WILL count toward earning the Southwest Companion Pass. Any points above 600, however, ARE considered bonus points, so those WILL NOT qualify toward earning the Companion Pass. There are 3 exceptions (Dollar, Payless, and Thrifty) which do not state in the fine print that the points are considered bonus points. So these may qualify for the Southwest Companion Pass. 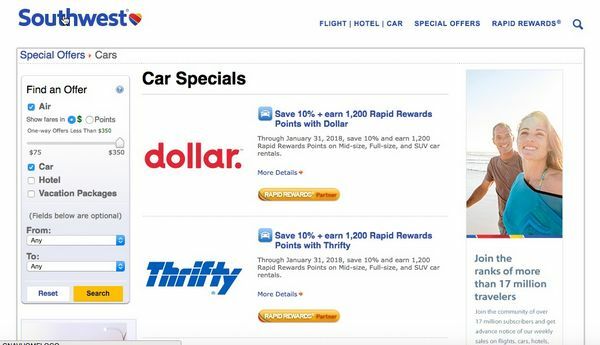 The current car rental offers from Southwest are listed below, which include potential bonus Southwest point earnings and often a discount, as well. 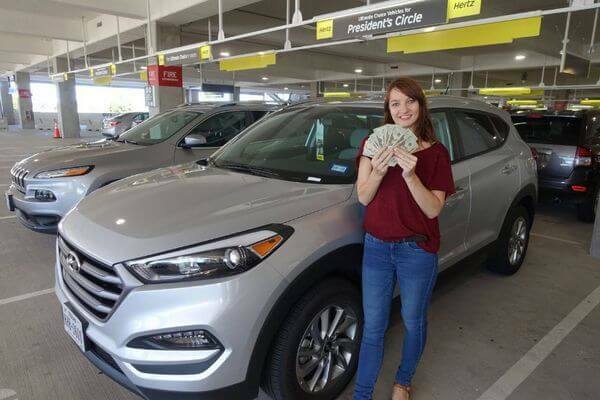 For Dollar and Thrifty, you can earn the points by renting any mid-size, full-size, or SUV car rental, and for Payless, the deal is good for any car rental. All of the deals are valid through January 31, 2018. Before you book your car rental through Southwest, there are a few things you should know to make sure it’s a good deal for you. First, just because it’s a deal on Southwest does not make it a good deal. You should compare pricing by visiting the car rental website directly or using a comparison site like Expedia. You can also sometimes score better deals on Priceline by offering a lower-than-published price. Also, the car rental companies charge an additional fee per day to allow you to earn Southwest points through your rental. This fee ranges from between $1 to $1.50 per day with a maximum of $8 per rental. There, you can enter your dates and destination to get a list of prices from the various companies. 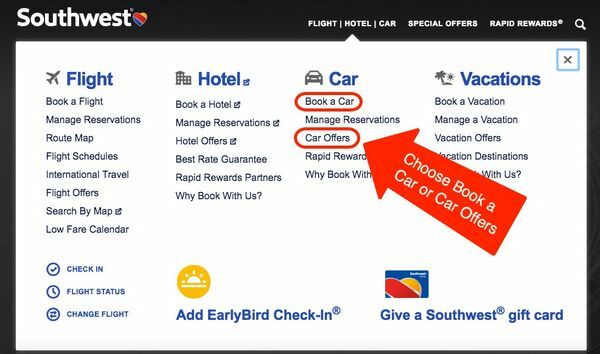 Once you have decided on a company, book through either the Car Offers page on Southwest.com where a promotion code is automatically entered for you. Or through the Book a Car page where you will need to manually enter the promotion code found on the Car Offers page for the rental company you would like to use. Make sure you meet the requirements of the promotion such as type of car and number of rental days required. When you go to pick up your rental car at your destination, be sure you have your Southwest frequent flyer number handy and give that number to the agent, letting them know you want to earn points for your rental. 4. Pay With Your Southwest Credit Card to Earn More Points! To earn even more points on your car rental, pay with your Southwest Rapid Rewards® Plus Credit Card, Southwest Rapid Rewards® Premier Credit Card, or Southwest Rapid Rewards® Premier Business Credit Card to earn 2 Southwest points per $1 on car rental expenses. While these cards do provide theft and collision insurance for rental cars, they are secondary to your own auto insurance. 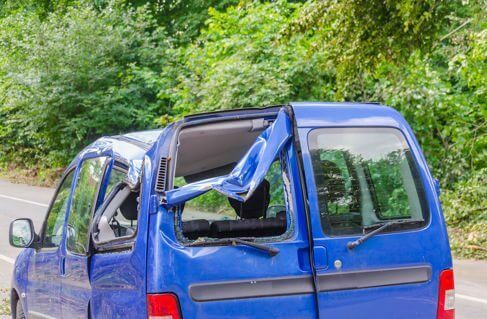 That means it will only cover items NOT covered by your primary auto insurance, requiring you to file a claim with your insurance, pay the deductible, and possibly see an increase in your rates. That said, it’s better to use cards like Chase Sapphire Preferred, Chase Sapphire Reserve, and others, because you’ll get similar theft and collision insurance for the rental car, but the coverage is primary. That means they will pay without you having to file a claim with your own insurance first. Here is the difference between primary and secondary rental car coverage. Plus, by using Chase Sapphire Preferred or Chase Sapphire Reserve, you can earn Chase Ultimate Rewards points, which you can transfer to Southwest Airlines at a 1:1 ratio. The points do NOT, however, qualify for 110,000 Southwest points needed to earn the Southwest Companion Pass. Your points should arrive within a couple weeks of completing your car rental and typically within a few days. Are Southwest Car Rentals a Good Deal? 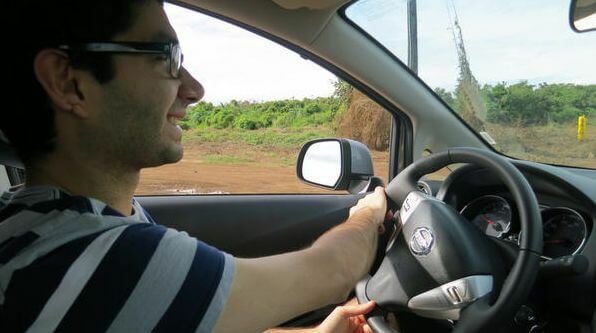 Finding a good deal on car rentals is an art, as much as flying nearly free and scoring cheap tickets! The Million Mile Secrets series on cheap car rentals will help you navigate the world of car rentals to ensure you find the best price. Deduct the value of the Southwest points you will be earning from the total price. Southwest points are worth ~1.25 to ~1.43 cents each, so you can multiply that amount by the number of Southwest points you will earn to get a total value of those points. For example, say you earn 2,400 Southwest points for a 7-day rental that costs $350. That’s worth ~$30 to ~$34 in Southwest flights (2,400 points x 1.25 or 1.43 cents per point). Add on the ~$1.50 additional fee per day and you’ll spend an extra ~$11 for your rental. So your effective net cost for the rental would be ~$327 to ~$331 ($350 rental fee + ~$11 additional charges – $30 or $34 points value). If you can find a deal significantly better than that elsewhere, you should consider it instead. 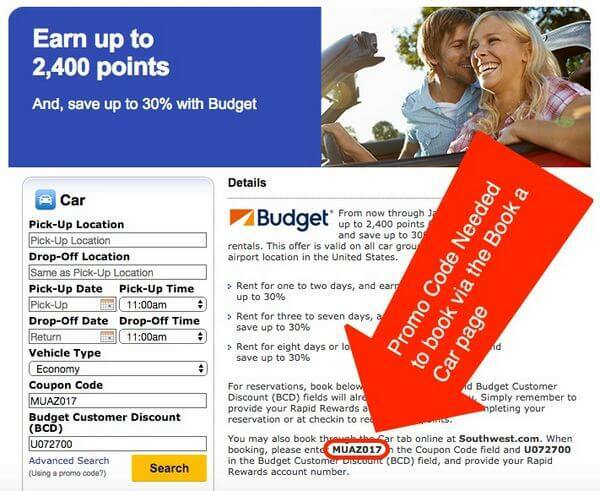 Booking a car rental through Southwest can earn you points for free travel on Southwest. But not all Southwest points you’ll earn from car rentals will qualify for the Southwest Companion Pass. By comparing pricing, understanding the deals, and ensuring you follow the process, you can extra points for an expense you would have incurred on your next trip anyway. Just be sure to comparison shop to get the best price! I recently used Costco for a car rental. Yes, you don’t get any points with any agency. So one needs to do the math to see if the price savings isn’t much with costco (last couple of times I got a better deal with my chase portal and once directly) and if one is trying to get a companion pass and every point is valuable. Totally agree on Costco for the best rates. See costcotravel.com. You do have to be a member, or have someone who is a member make the reservation. We got much better rates renting through Costco in BNA and MSY later this month.